Tobacco giant is serious about its intention to eradicate cigarettes, Mark MacGregor says. The recently launched campaign from Philip Morris International encouraging smokers to quit is proof that the tobacco company is serious about its intention to stop selling cigarettes, its director of corporate affairs told Campaign. The Marlboro manufacturer used a press ad at the start of the year to publicise its intention to eventually phase out cigarettes in favour of alternative products – vaping and heated tobacco device Iqos. 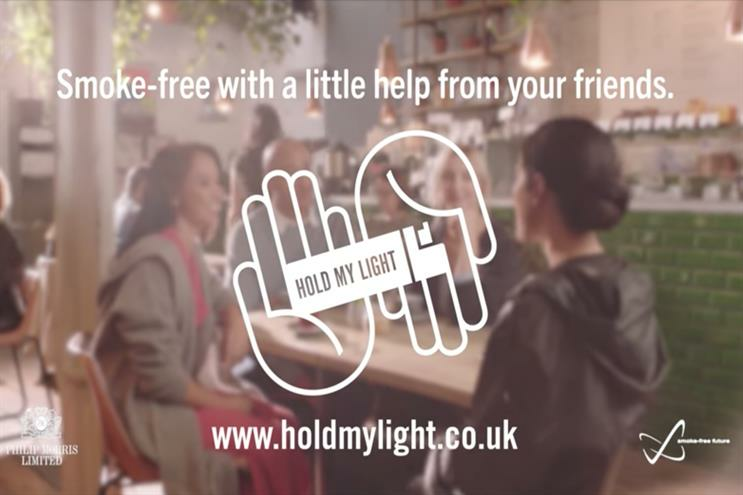 This was followed last month by a campaign, "Hold my light", including an online ad (below) and a wraparound in The Daily Mirror, that encouraged smokers to quit by asking their family and friends for small acts of support. Speaking to Campaign, Mark MacGregor said he had been "surprised" by attacks from people and organisations that have said big tobacco should have no role in reducing smoking rates. "It’s very naïve of people to think we’re just going to shut down our business," he said. "And if we’re not going to do that, it feels like the action we’ve taken is proof [of our intentions], whether people want to believe it or not. "I take the view that large companies make commitments, and if you’ve made a huge one like this, you’ve got to start to deliver on that. "One of the criticisms we’ve had before is that all we’ve had are words, not actions – well, running a campaign to persuade British smokers to quit feels like an action. I’d say to critics that we’re doing precisely what you’d expect a company with that ambition should do." But MacGregor admitted he could not yet say when the business would make good on the pledge to stop selling cigarettes, saying that it would depend not just on the proportion of its own sales that were coming from alternatives, but also the external context. "Of course we could simply stop doing it tomorrow – but all that would happen is people would buy their cigarettes from someone else. So we’ve chosen a different path, which is in some ways more difficult." He argued that if the move was to have an impact on smoking rates, it needed to result in people either quitting altogether or switching to an alternative. While the jury is still out on the long-term health implications of vaping and heated tobacco, bodies including Public Health England have said they are significantly less harmful than smoking. In terms of public awareness of this, things were moving in the wrong direction, MacGregor said. He cited data from Action on Smoking and Health that 27% of people in the UK now believe that vaping is worse for health than smoking, compared with only 7% who believed this four years ago. The number of people taking up vaping has also plummeted from 800,000 in 2014 to just 100,000 last year. During that time, tough new restrictions have come into force on how e-cigarettes can be advertised, banning TV advertising along with certain other media. In some countries, the challenge is even more pronounced – Australia is among those where e-cigarettes are banned. Philip Morris wants to be able to put inserts in its cigarette packs to both encourage quitting and promote its alternatives, MacGregor said, but this is currently illegal. He would also like to see programmatic technology be used to advertise alternatives to aspiring quitters without exposing non-smokers to them: "It doesn’t strike me as beyond the wit of man to devise campaigns that could be seen almost exclusively by smokers." But he said the "Hold my light" campaign was "the culmination of many things we’ve done – it’s just one more step among many". Other moves include only selling tobacco alternatives at venues such as Formula One circuit Silverstone, where Philip Morris has exclusive rights to sell tobacco. "Hold my light" was informed by talking to some of the UK’s 7.5 million remaining smokers about the barriers that had stopped them from quitting, MacGregor said: "We found that a lot of the public health campaigns in the past have been very successful in getting people to understand that smoking is dangerous – but they’ve not been as successful at getting them to quit." The type of moral support suggested by the campaign was based on what smokers told them would help, he said: "They didn’t want grand gestures, but tokens of support from lots of people." Another charge that has been levelled at Philip Morris is that it is hypocritical to talk up its anti-smoking credentials in the UK while it continues to advertise cigarettes in other parts of the world. But MacGregor claimed there was a widespread "genuine misunderstanding of the amount of advertising that is possible anywhere in the world", saying that most countries now have stringent rules, even though most are somewhat more liberal than the UK. "Our commitment to going smoke-free is a global one," he insisted, claiming that Philip Morris had often advocated for tightening the restrictions around advertising. And in the face of unsurprising cynicism, there is one point he is keen to drive home: "We are the only cigarette company that has made this commitment."